Lost track of how many third-party apps and websites have access to your Facebook account? Trust me, you’re not the only one. As it turns out, I’ve granted more than 30 (!) apps and websites access to my Facebook profile over the years. Some of them were games that I haven’t played in ages (remember Words With Friends? ), others were apps that I’d tried once or twice and then immediately forgot (like Shareagift), and still others were apps with social features that I never use (like the ability to share my Netflix viewing history with Facebook friends—no thanks). If you don’t want a specific app to have access to your Facebook account (including such personal info as your username, your gender, the Facebook networks you’ve joined, and your friends list), there’s an easy way to yank its Facebook privileges. Of course, doing so may log you out of the app and/or disable some social features. You can cut off an app’s access to your Facebook account directly from your Android or iOS device. Don’t want any apps or websites poking around your Facebook profile? If so, you can slam the door on all of them at once. Open the Facebook app, tap the three-line menu button (in the lower-right corner for iOS, or the top-right on Android), then tap Settings, Account Settings, and Apps. 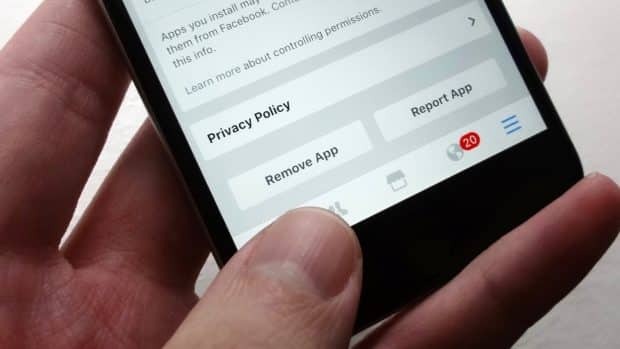 To see a list of all the apps and websites that you’ve granted access to your Facebook account, tap “Logged in with Facebook.” Tap an app to change the type of Facebook data the app can see (such as your friends list or your email address), or tap Remove App to cut off all its access. If you don’t want any apps or websites accessing your Facebook account, tap Platform (from the Apps and Websites screen), tap Edit (under the Apps and Websites heading), then tap Turn off Platform. Once that’s done, all your Facebook apps will be deactivated, and you won’t be able to add any more to your profile. Have a change of heart? Never fear—you can always turn Facebook’s Platform feature back on again. 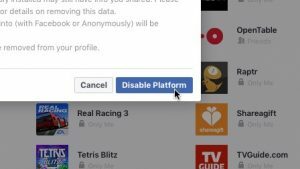 Once you deactivate Facebook’s Platform feature, no third-party apps or websites will be able to access your Facebook profile. Visit Facebook in your browser, click the little downward arrow in the top-right corner of the page, click Settings, then click Apps in the left column. On the next screen, you’ll see a list of all the apps and websites that you’ve granted access to your Facebook account. Click an app or site to inspect or change what it can access, or click the little “x” next to its name to delete it. To cut off Facebook access to all apps and websites, click the Edit button under the Apps, Websites and Plugins heading, then click the blue Disable Platform button.